Gobble! Gobble! Gobble! Gobble! Gobble! 21 Songs from the Musical Mystery Tour albums with easy piano parts and guitar chords. By train, tractor, bicycle or even hot-air balloon - the Musical Mystery Tour introduces you to a lively collection of characters and places. Discover snowmen and kings, parrots and flamingoes, sleepy sheep and weeping willows - and even a donkey who can't-can't do the can-can! 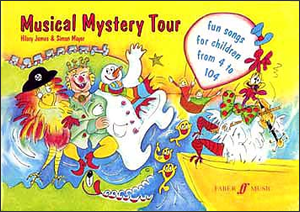 These delightful, witty songs are guaranteed to capture the imagination, and will be enjoyed by children of all ages - from 4 to 104! Hilary James and Simon Mayor have written and performed songs for a wide range of radio and television programmes, and work regularly with children's audiences. 'Hilary James and Simon Mayor's CD of the same name has been the most heavily played recording in our household (before children's bedtime) since I received it for review two years ago and the timely publication of these "fun songs for children from 4-104"comes just as my children take their first tentative steps in learning to read and play music. The lyrics are extremely enjoyable (their wit is equally amusing to children and adults) and the tunes as infectious as anything your children are likely to bring into the house. The quality of Hilary and Simon's performance enhanced the appeal of their music on CD and cassette, and the presentation of the book continues in that vein. From Hilary's colourful cover and the spirited cartoons to the clearly laid out music and lyrics the whole thing is a pleasure to read and to play.